Forward to 6G Prognostic and Predictive IHC . Back to 6E The Role of Immunohistochemistry . Did you hear about the angry pancake? He just flipped! 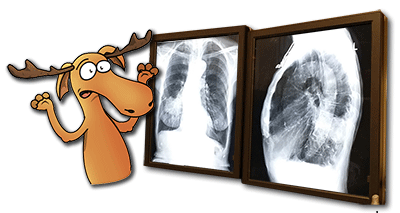 There are many situations in which immunohistochemistry can support the light microscopic opinion in lung pathology. 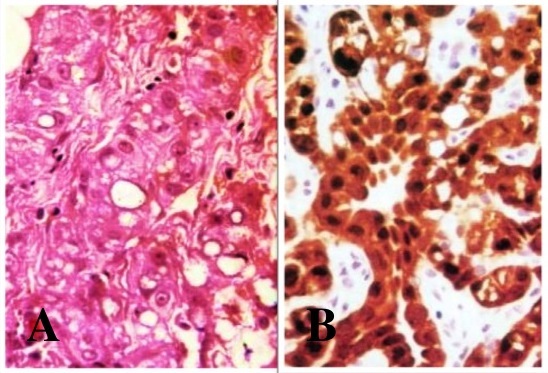 The immunohistochemistry (IHC) markers commonly used to identify adenocarcinoma (TTF-1) and squamous cell carcinoma (p63, CK5/6, 34βE12) may be used. Two IHC markers of TTF-1/p63 is sufficient for sub-typing of the majority of tumors as adenocarcinomas versus squamous cell carcinoma; addition of CK5/6 may be required in a small subset of cases. Figure 6.9 TTF-1-Positive IHC for Adenocarcinoma. This all sounds really complicated. 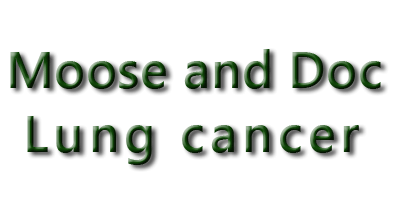 Not really, it simply means that the staining technique can help distinguish between different types of lung cancers. I’m not giving up on my dreams, I’m just going to keep sleeping. Small cell lung cancer is defined by light microscopy, and the most important stain is a good-quality H&E-stained section. In problem cases, such as the large cell variant of neuroendocrine carcinoma (LNEC), IHC can help in making the distinction from other tumors. Immuno-staining for pan-cytokeratin, such as AE1/AE3, demonstrates that the tumor is a carcinoma rather than a lymphoid tumor. The most useful neuroendocrine markers include chromogranin, CD56, and synaptophysin; these are used as a panel with CD56 being positive in up to 90% of cases. Figure 6.10 Synaptophysin-Positive IHC for LNEC. neuroendocrine carcinoma (LNEC) of the lung. I’m going bananas. That’s what I say to my bananas before leaving the house. E-cadherin is expressed in all adenocarcinomas and approximately 20% of mesotheliomas. TTF-1 expression is found in up to 70% of lung adenocarcinomas and no mesotheliomas. Calretinin immunostaining is positive in 80% of mesotheliomas and 6% of the adenocarcinomas. Cytokeratin 5/6 expression is detected in 5% of the adenocarcinomas and 60% of the mesotheliomas. E-cadherin is almost 100% sensitive for pulmonary adenocarcinoma and TTF-1 is almost 100% specific for pulmonary adenocarcinoma. If E-cadherin is positive and TTF-1 is negative, a secondary panel of antibodies may be used: this panel may include antibodies to BerEP4, LeuM1 (CD15), calretinin, cytokeratin 5/6 and thrombomodulin. Figure 6.11 Calretinin-Positive IHC for Mesothelioma. representing a metastatic adenocarcinoma. (H&E x 60). The IHC profile is similar to melanomas elsewhere in the body; melanomas are S100, HMB-45, and Mart-1 positive and negative for keratin. An IHC panel to be used in the differential diagnosis of melanoma versus lung carcinoma could include pan-cytokeratin, S100, TTF-1, and Mart-1. 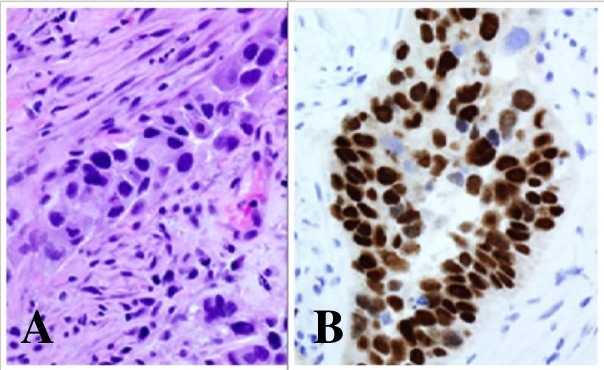 Figure 6.12 HMB-45-Positive IHC for Metastatic Melanoma. cytoplasmic staining (brown) of the tumor cells with antibodies to HMB045. I see now – IHC helps to diagnose different cancers. Exactly in the above slide this is a skin cancer that has spread to the lungs, not a primary lung carcinoma. I’m loving IHC, can we call it the ‘Incredible Hector Charm? The immunophenotype of cells of MALT lymphoma is virtually identical to that of non-neoplastic, marginal-zone B-cells: CD20+, IgD−, CD5−, CD10−, Bcl6−, cyclin D1−. No specific IHC marker has yet been identified for MALT lymphoma. The presence of a diffuse infiltrate of CD20+ B-cells between (cytokeratin+ glands) is highly suggestive of lymphoma. Staining for CD21 and CD10 can help to identify lymphoid follicles. to CD20. This is low-grade B-cell lymphoma (BALToma). (IHC for CD20 x60). I might look like I’m doing nothing, but in my head I’m actually quite busy.